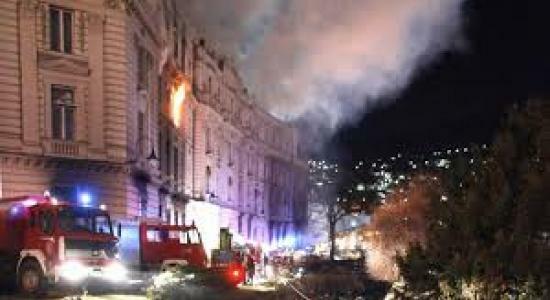 Some of the most important historical records of central Europe in the 20th century are feared lost, after an incidence of fire at the state archives of Bosnia-Herzegovina in Sarajevo. The archive contains documents from 1878 to 1918 when the Austro-Hungarian ministry of finance was in charge of Bosnia. It also contains older material from the Ottoman period and documents from the War Crimes Commission after the World War II which was targeted by protesters on Friday. The staff members were restricted to entering the building to assess the damage. Historians are concerned that important documents have been lost in the disaster. Archive director Adamir Jerkovic condemned the incident as an “act of vandalism”. News of damage comes amidst central Europe’s preparation to commemorate the centenary of the start of the World War I. The National Museum of Bosnia-Herzegovina was closed in 2012 and the National Library was burnt down in 1992 aggravating fears that the region would be left without key empirical records of its own history. There have been large anti-government protests in Bosnia-Herzegovina since the closure of a number of recently privatized state factories in the northern town of Tuzla last Wednesday. Protests soon spread to other towns, including Bihac, Mostar, Sarajevo and Zenica.